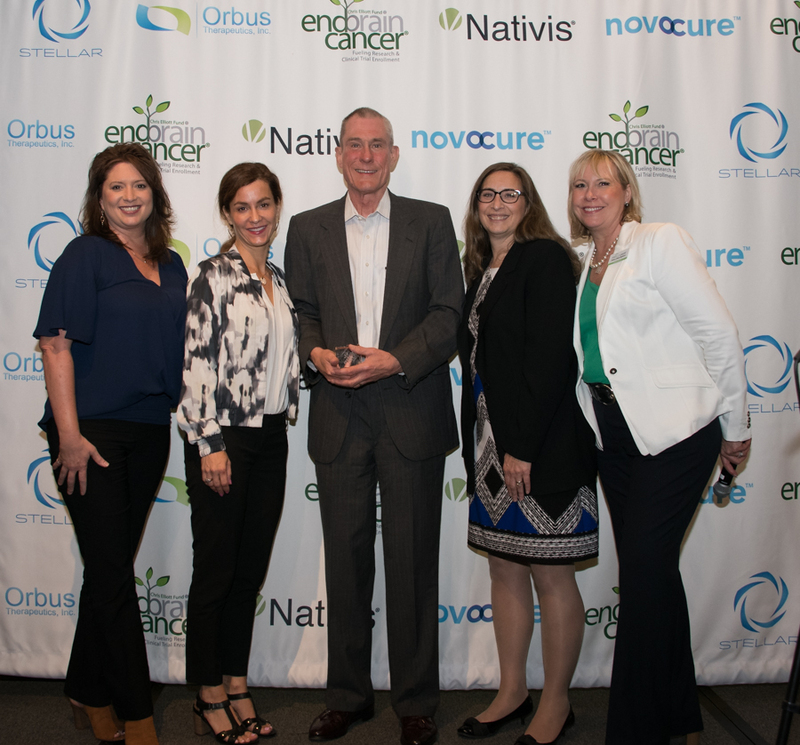 On May 17th the EndBrainCancer Initiative’s 7th annual Brains Matter & Igniting Hope Celebration, Awareness and Fundraising Dinner was held in Bellevue, Washington near Seattle. 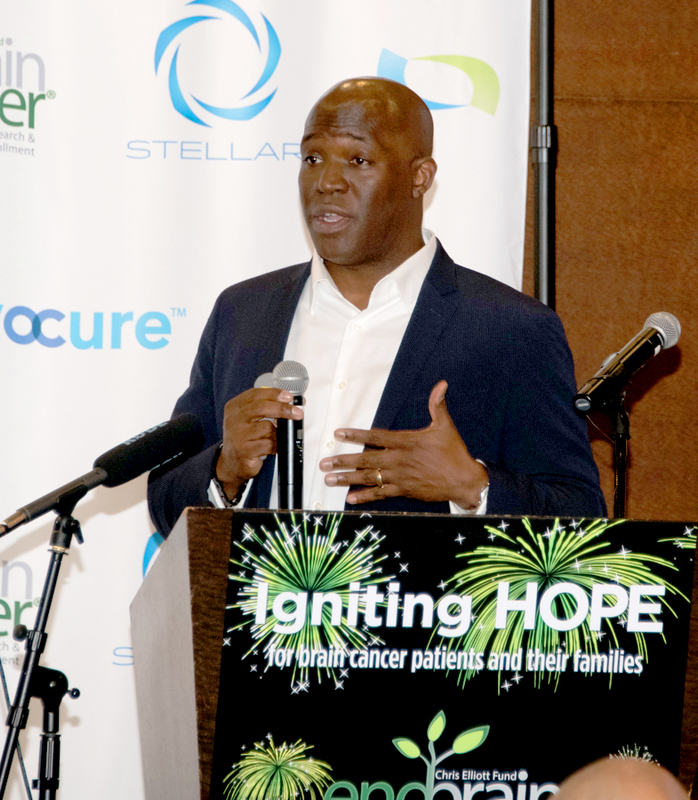 In attendance were many brain cancer patients, survivors and their family members as well as individuals representing key segments of the brain cancer research and treatment community. The dinner event generated over $75,000 toward the EndBrainCancer InitiativeI’s spring campaign (still going) with its goal of $100,000. The organization, originally formed as The Chris Elliott Fund, also marked its 16th anniversary. The American Society of Clinical Oncology (ASCO) named immunotherapy 2.0 as the advance of the year in 2017 and now immunotherapy is a standard treatment option for people across a broad range of cancers. However, immunotherapy is still not a standard treatment option for brain cancer patients. The EndBrainCancer Initiative is currently focusing much of its education, awareness and outreach efforts on the role of immunotherapy in treating brain cancer. After not qualifying for a number of clinical trials, Ken enrolled last September in a clinical trial with Dr. Allan Friedman of Duke University utilizing a re-engineered, tumor-seeking bacteria. Recently, Ken got the results of his latest MRI—“no measurable change in the tumor” with the three previous scans showing tumor reduction and dissipation. The EndBrainCancer Initiative would like to thank its corporate partners and event sponsors who have made this event possible (Brains Matter Dinner Event Page): Keynote Sponsor, Foundation Medicine and Educational and Event Sponsors OncLive, CURE Magazine, Oncology Nursing News, Orbus Therapeutics, STELLAR Trial, Celgene, Nativis, glassybaby, University of Florida Health, The Preston A. Wells Center for Brain Tumor Therapy, The Preston Robert Tisch Brain Tumor Center at Duke, Synaptive Medical, JMS Construction, Brotherton Cadillac, Hatchbuck , Tito’s Handmade Vodka, and Wrecking Ball Demolition. The EBCI is seeking to engage eight additional industry Corporate Partners to help fuel research, increase patient outcomes and provide IMMEDIATE ACCESS to specialists, to advanced treatments, and to clinical trials. The EBCI is seeking to engage eight additional industry Corporate Partners to help fuel research, increase patient outcomes and provide IMMEDIATE ACCESS to specialists, to advanced treatments, and to clinical trials. 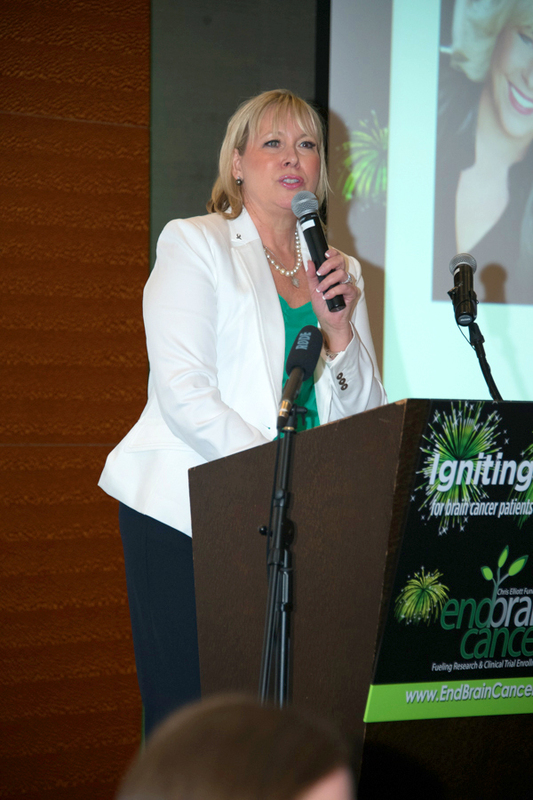 Since its founding, EBCI has helped thousands of patients, caregivers, and their families and has become a credible and trusted resource at all levels in the brain cancer treatment community from patients to research institutions to pharmaceutical and regulatory entities. EBCI also participates as the “Patient Voice” in clinical trial design. Founder and President, Dellann Elliott Mydland has been published in CNS Oncology. The organization and its staff support 900+ patients and caregivers free of charge annually through the Direct Connect Program, and provide Education/Awareness/Outreach to over 8.7 million annually, including members of the Brain Tumor Community. EBCI is a member of the American Society of Clinical Oncology (ASCO), Society for Neuro-Oncology (SNO), American Association of Neuroscience Nurses, American Association for Cancer Research, and Life Sciences Washington, among other organizations. If we can help, please contact us at WeCare@EndBrainCancer.org or 425.444.2215. Duane Mitchell, M.D., Ph.D. is a world-renowned expert in translational research and immunotherapy. He is Co-Director of the Preston A. Wells Jr. Center for Brain Tumor Therapy at the University of Florida. Dr. Mitchell received his medical degree and doctorate degree in immunology from Duke University. Dr. Mitchell now leads a comprehensive brain tumor program at the University of Florida focused on translational research. He also currently serves as a chartered member of the NIH study section on Cancer Immunopathology and Immunotherapy, Chair of the NCI Pediatric Brain Tumor Consortium Immunotherapy Committee, and member of the NCI Brain Malignancy Steering Committee Working Group. Dr. Mitchell has more than 40 refereed journal publications, 15 textbook chapters and scientific reviews, and is inventor on five United States patents on findings from his oncological research. More about Dr. Mitchell and his work can be found on his University of Florida Bio Page.